Swanscombe cement works, the largest of the many A.P.C.M. cement works in North Kent, has seven 0−4−0 saddle tanks to work the considerable traffic. Six were built by Hawthorn Leslie (four in 1928, one in 1929 and one in 1935) and the last by Robert Stephenson & Hawthorns in 1948. All seven are painted green with the running number on each side of the tank. There are no diesels; the one tried could not manage the poor track and was continually "sitting down". There is no prospect of having any until money can be spared for relaying several miles of track. The works can be divided for convenience into three areas. The first two are old chalkpits, dug each side of the main road, while the third contains the line to the workings. The first area is bisected by a private road with the cement works proper on one side. On the other side is the single road engine shed and works, and also an awning over one track where engines stand when not in use. A single line runs past the works, and across the marshy countryside to the jetty on the river Thames. Another line runs across the road and winds its way around the main works until entering a tunnel under the main road. This brings it to the second old pit, where are situated two unloading tips for arriving trains. As can be seen from the map, a connection to British Railways struggles up and round the side of the pit. (Sand all over the rails shows the severity of the climb.) On the opposite side of the pit, another single line dips downwards into a tunnel under BR, a road and the connecting line, and emerges into a long, deep and wide cutting. There are two passing loops on the way to the workings, of which one has watering facilities, and another tunnel, and a high footbridge. At the middle pit, an arriving train runs above one of the two tips, and backs down on to the tip. 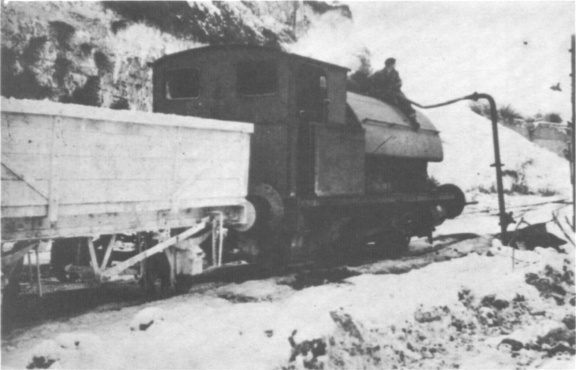 When the end wagon is on the tip, the wagons are braked, and the locomotive is uncoupled so that it can go up to the end of the line to obtain coal and water. The tips are similar to mechanical coaling plants on B.R. and deal with one wagon at a time. As each wagon is unloaded, it runs along the siding by gravity, until the train is reformed at the other end of the loop. The locomotive then comes back and couples onto the same end as before. The next train brings the single line tablet which is hung on a hook on a post. 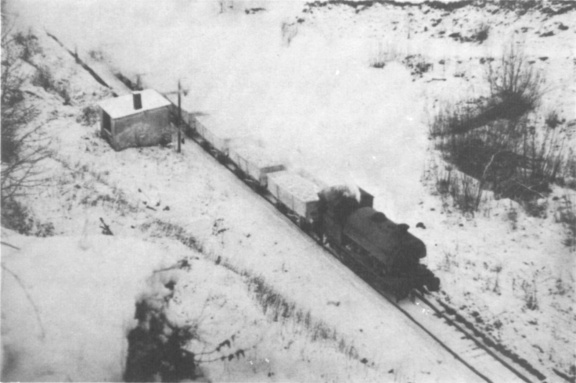 The first train collects the tablet and then goes down to the workings, the locomotive propelling the wagons. I spent some time around the footbridge, photographing the trains which passed at frequent intervals. The maximum speed was about 20m.p.h., but trains lurched terribly, due to the poor track. When the track deteriorates so much as to necessitate its replacement, diesels will doubtless be purchased. From the opinion of many of the men to whom I spoke, however, steam should retain its supremacy for some time to come.